Billy Dunn is a paunchy veteran cop from the streets of Dorchester. Jonathan Papelbon is a strapping young fireballer from the deep South. The former protects the Red Sox bullpen at Fenway Park. The latter protects Red Sox leads. In the course of their work, the unlikely pair have formed an improbable friendship and originated a good-luck ritual that brings thousands of Fenway's bleacher creatures to their feet. It goes like this: In the late innings with the Sox clinging to possible victory, manager Terry Francona walks to the pitcher's mound and motions with his right arm to summon his All-Star closer. Rock music fills the park . Dunn flings open the bullpen gate and Papelbon steps onto the field. Papelbon and Dunn then square their fists and knock knuckles to the delight of Red Sox fans everywhere. Dunn shuts the bullpen door. It's then up to Papelbon to slam the door on the opposing team. The knuckle knock started last season when an especially pumped-up Papelbon bumped fists with Dunn on a whim. After he had a good outing, the 26-year-old pitcher said, he told Dunn, "All right Billy, now we've got to do it every time." "I think it's his way of giving me a little recognition, to say thanks," says Dunn, a former Marine who has two large tattoos etched into his meaty forearms: "Born to Raise Hell" and "USMC." With the Red Sox boasting the best record in the majors, the knuckle knock has captured the imagination of Sox fans from the bleachers to the blogosphere. Red Sox Nation likes to speculate about the workaday guy who has become a big-league good luck charm. 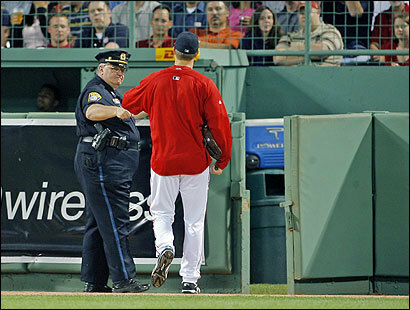 "Papelbon giving that cop a high-five on his way out of the bullpen is one of my favorite things in baseball," one Sox blogger recently mused. "That cop must be a god to his friends and family." Before achieving fame as the "bullpen cop," Dunn, 55, made a name for himself with the Boston Police Department during the gang wars a decade and a half ago. Dunn, who now lives in Quincy and dotes on his eight grandchildren, was a feared gang unit detective with a reputation for toughness. He was one of the officers probed for possible brutality in the aftermath of the 1989 Carol Stuart murder. He was cleared of those allegations. More recently, he was a witness against two Yankees players involved in an October 2003 bullpen fracas that sent a Fenway groundskeeper to the hospital. Charges against the players were dropped after they completed anger management courses and community service. Since 1999, Dunn has been detailed to the bullpen at Fenway, where he spends nearly every home game guarding relief pitchers against disruptive fans. The department assigns about two dozen officers for games, and Dunn is one of about 10 regulars. He is such a constant presence in the bullpen that players describe him as almost another teammate. "He knows when to talk and when not to talk," Papelbon said in a recent locker room interview. "He knows when, hey, it's party time down there, [or] it's game time and everybody in this bullpen is starting to get prepared to go in the ballgame to pitch to win." Although Dunn has become known for the knuckle knock, he is also a part of more obscure bullpen traditions. Some help pass the time during the early innings. He and reliever Manny Delcarmen share the record -- four -- for flicking the most pumpkin seeds into a Dixie cup from 30 feet away. "When they first come out to the bullpen it's like us [police officers] hanging around before roll call," Dunn explains. "Once . . . they start doing their warm-ups and their stretches, it's all business." Dunn said the pitchers treat him like one of their own. They e-mail him over winter break. They yell at him when they catch him sneaking 3 Musketeers bars from the team candy bag because they know he has diabetes. They presented a signed team jersey to him for Veterans Day. They refrain from teasing him when he sings the national anthem -- something he's done at Fenway several times -- because they understand how patriotic he is. Despite the opportunity for such big-league friendships, the Fenway shifts are not as coveted as one might imagine, officers say, because they require a lot of work. Also, officers have to work more than six hours to get paid for a full shift, compared with four hours at construction sites. For Dunn, a lifelong Sox fan, who saw Ted Williams play when he was a boy, none of that matters. "They can lose every game for the rest of my life," Dunn said in an interview just outside Fenway. "I'll die a happy man. . . . I've seen a lot of history committed by these guys." Those moments include close-up views of the longest nine-inning game in baseball history and the demise of the curse in 2004, when the Sox won their first World Series in 86 years. Dunn said he sees his job as not unlike that of the players, despite the fame and millions of dollars that separate them. "We both wear a uniform that says Boston, and we both have jobs to do," he says.